Alajuela is a province of Costa Rica. It is in the north-central part of the country, bordering Nicaragua. The provincial capital is the city of Alajuela. The Alajuela province borders the provinces of Heredia to the east, San José to the south, Puntarenas to the southwest and Guanacaste to the west. Nicaragua is to the north of the province. Alajuela is the third largest province of Costa Rica, after the Puntarenas and Guanacaste provinces, with an area of 9,757.53 km2 (3,767.40 sq mi). 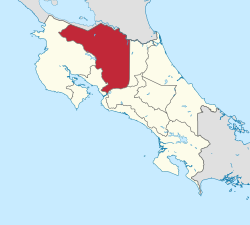 The province is in the western part of the Central Valley and is crossed by the Cordillera Central ("Central mountain range) and the volcanic Cordillera de Guanacaste ("Guanacaste mountain range). In the northern part, along the border with Nicaragua, are the plains of the San Carlos and Frío rivers. Two of the most active Costa Rican volcanoes are in this province: the Poás, 2,708 m (8,885 ft) high, and the Arenal, 1,630 m (5,350 ft) high. The people of the province are known as Alajuelenses, both men and women. The Alajuela province had a population, in 2011, of 848,146, for a population density of 86.9 inhabitants/km2. The canton of Alajuela, with 254,886 inhabitants, is the canton with more inhabitants. The Alajuela province is divided in 15 cantons, which are divided into 113 Districts. The main economic activity in the province is farming. In the southern part of the province, tropical ornamentals, coffee, tubers, and Leaf vegetables are the major crops. Toward the north and northeast, rice, corn, pineapple, bananas, and sugarcane are important crops. There is also an important cattle raising industry in the province, mainly in the San Carlos canton. World's Largest Oxcart, Sarchí, Valverde Vega. The Arenal Volcano in La Fortuna, San Carlos, is active. Night volcanic eruptions can be seen. ↑ 1.0 1.1 1.2 "Anuario Estadístico 2012 - 2013" (PDF) (in Spanish). San José, Costa Rica: Instituto Nacional de Estadística y Censos (INEC). June 2015. Retrieved 11 December 2016. ↑ 2.0 2.1 2.2 "Anuario Estadístico 2012 - 2013" (PDF) (in Spanish). San José, Costa Rica: Instituto Nacional de Estadística y Censos (INEC). June 2015. p. 102. Retrieved 11 December 2016. ↑ "Anuario Estadístico 2012 - 2013" (PDF) (in Spanish). San José, Costa Rica: Instituto Nacional de Estadística y Censos (INEC). June 2015. p. 51. Retrieved 11 December 2016. This page was last changed on 14 November 2017, at 22:27.